The new Anarky has his own version of Red Robin's Hit List! Ulysses Armstrong has made a record of Gotham City teens who could be Red Robin – and he's murdering them one by one. 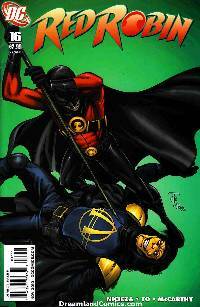 With an incapacitated Tim Drake crossed off his list, can Red Robin stop Anarky before the villain attacks his next target? And with the deaths of innocents weighing on his conscience, how far will Red Robin go to cross Anarky off his own Hit List?